John MacArthur is a study in consistency. Through more than forty-five years of public ministry he has simply taught the Bible. And the more he simply teaches the Bible, the more his audience and his influence grow and expand. In those years he has taught (and written commentaries) on every book of the New Testament while publishing dozens of bestselling books. His most recent book, Parables, is vintage John MacArthur. This new book shows how Jesus used parables to reveal the unfolding mystery of God’s kingdom. MacArthur does this by teaching through a series of Jesus’ most prominent and powerful parables (though, because he has already written an entire book on Jesus’ best-known parable, he passes over The Prodigal Son). In each case he describes the context in which Jesus delivered the parable, he explains what Jesus meant to accomplish, and he shows what it teaches about God and his kingdom. It is just what MacArthur does—sound, helpful, quality Bible teaching. But before he does any of this, he invests some up-front effort in helping the reader understand the very literary form of the parable. What is a parable? We probably know one when we see one, especially in the gospels. But how many can define it? The most distinct marker of a parable is that it uses illustration and comparison to teach a spiritual lesson. MacArthur says, “A parable is an ingeniously simple word picture illuminating a profound spiritual lesson.” A parable always makes a comparison between something commonplace and some truth in the spritual realm. Jesus did not invent the form, though certainly he mastered it like no one else before or since. MacArthur goes on to address two important and controversial questions: Why did Jesus teach in parables, and how can we interpet his parables rightly? After looking at some examples of sloppy thinking when it comes to parables, MacArthur shows that “Jesus’ parables had a clear twofold purpose: They hid the truth from self-righteous or self-satisfied people who fancied themselves too sophisticated to learn from Jesus, while the same parables revealed truth to eager souls with childlike faith—those who were hungering and thirsting for righteousness.” And, according to Matthew 11:25-26, Jesus considered both of these results successful and gave thanks to his Father for each of them. Having explained how to interpret and teach parables, MacArthur goes on to do that very thing. 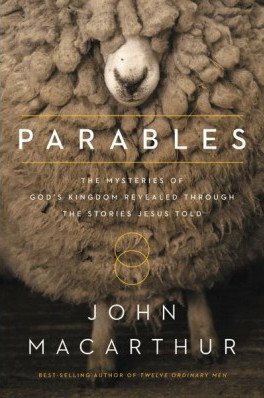 Parables shines a light on Jesus’ stories and, through them, to the Savior who told them. It’s a helpful, enjoyable, powerful book.